Frank Holloway's career in the police has had its ups and downs—all the way up to Detective Sergeant and all the way back down to Detective 1st Class, It's not that he's not good at his job: it's just that the service is changing around him, and he hasn't. In short, he's a bit of a dinosaur, a larrikin who's more likely to turn a blind eye to a bloke stealing something small for his family or to deal out a spot of summary justice behind the wharf sheds to a kid caught pilfering than to start on all the paperwork that his superior officers are so keen on. Frank grew up in the Rocks district of Sydney when it was just a slum, with the male side of his family, as far back as anyone can remember, all being wharfie's. For him, breaking the mould was a long-term dream. For his family, it was a source of great shame, particularly that he opted to the wharfie's' traditional enemies, the Water Police. They were mortified when he persuaded his younger brother to join up too. Their other brother Jimmy, who drives a crane on the wharves, won't even talk to them. Being married to the police force doesn't, however, leave much room for other relationships in his 40's, Franks been twice married and divorced already. He sometimes jokes to his partner Rachel Goldstein that he's on the look-out for number three—"Hey Goldie, how about you?" In reality, he's not to happy that Goldie is technically his boss, even though he has far more experience, but he's the only one who's allowed to slag her off. Just let anyone else try. 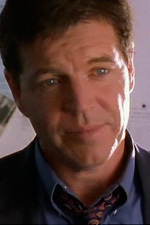 Colin Friels is one of Australia's best-known actors in both television and film. It was a big decision to take on the lead role in his first ever television series but, after he saw the scripts for WATER RATS, he decided this was the one. He loves the fact that it's being shot, directed and written by Australians, with the of exciting interweaving plotlines he can really get his teeth into. It doesn't hurt either that WATER RATS is being made virtually in his own backyard—he lives right on Sydney Harbour, not half a mile from Goat Island. "Maybe in a crude way I am trying to find stories about my own place," he says. He also identifies strongly with the character of Frank Holloway. Like Frank, he was brought up in a strongly working class family, with his father working as a carpenter and his mother doing French polishing in a factory. Like Frank he too has broken the mould. And, just like Frank, he's proud of his background, talking about 'dignifying' his humble past. "You have to bring a sense of grace to things," he says. "I admire some of the actors who can do that and it's what I'll be trying to do. Working for a long spell in television is something Colin has never done, but he has no regrets about turning his back on film for a while. "I'm not crazy about features. They're like watching grass grow and I find that very debilitating." says Colin. "Features aren't an actor's medium, unless you have a fantastic role and they are rare. They're really a director's medium whereas television is much more of an actors medium. you work fast and can really get your teeth into it. There's also a decided lack of pretension… I want to do the best work I possibly can in WATER RATS." After his graduation from NIDA in 1976, Colin has rarely been without work. He has chalked up a fine reputation in the theatre, with his productions including a great deal of Shakespeare. His most recent plays include THE INCORRUPTIBLE, THE TEMPLE, SHADOW AND SPLENDOUR, THE CHERRY ORCHARD, ORPHANS, SWEET BIRD OF YOUTH, ZASTROZZI and IL MANGNIFICO. In 1986 he won an AFI Award for his portrayal of Malcom in the film of the same name and he recently played the lead in MY ENTIRE LIFE. His other feature credits include DARKMAN, DINGO, WEEKEND WITH KATE, GRIEVOUS BODILY HARM and GROUND ZERO. In the last couple of years he has also done some prestigious television movies, most recently on the Nine Network's HALIFAX f.p.—which earned him another AFI Award—STARK and the PRIDE episode of SEVEN DEADLY SINS.